The costs of pay and benefits for the Pentagon’s military and civilian personnel make up the single largest category of costs in the DoD budget. In the PB 2018 request, the Trump administration projected a total force of 2,212,900, with an active-duty end strength of 1,314,000 and 815,900 in the reserve components. In addition, the request would fund 740,000 DoD civilian employees, with an additional 480 funded in the OCO budget. Funding these military end-strength levels would cost $133.9 billion in military personnel (MILPERS) appropriations; $7.8 billion in accrual payments for current servicemembers’ TRICARE benefits; $7.5 billion in concurrent receipt accrual payments for military retirement; $9.4 billion in other benefits, including the DoD’s network of K–12 schools; and $34.6 billion for the Defense Health Program. About 60,000 DoD civilians are employed by the Defense Health Program, and smaller numbers are employed by the DoD Education program and other benefits programs; their salaries are included in the total funding for these programs. The pay and benefits for the balance of DoD civilian employees amounts to $75.2 billion for FY 2018 (see Figure 4-1). Overall, the pay and benefits of military personnel and civilian employees accounts for $272.7 billion, or 42 percent of the total $647 billion FY 2018 DoD budget request (see Figure 4-2). DoD also employs thousands of contractor personnel. As of FY 2015, about 44 percent, or $75 billion, of DoD’s total contracting obligations went towards various service contracts. These figures do not include the $183.1 billion requested in PB 2018 for the Department of Veterans Affairs, the $83.8 billion of pension obligations for current military retirees paid by the Treasury, or the $9.7 billion of payments for TRICARE for life for current beneficiaries paid by the Treasury. Source: Office of the Under Secretary of Defense (OUSD)(Comptroller), Chief Financial Officer (CFO), Department of Defense Fiscal Year 2018 Budget Request: Defense Budget Overview (Washington, DC: DoD, May 2017), Table 5-1, “Pay and Benefits Funding,” available at http://comptroller.defense.gov/Portals/45/Documents/defbudget/fy2018/fy2018_Budget_Request_Overview_Book.pdf. Increasing the size of the armed forces was one of President Trump’s key campaign pledges. The PB 2017 planned force structure levels across the Services in FY 2018 would have totaled 1,271,200 in the active-duty forces and 802,300 in the reserves, for an overall end strength of 2,073,500. The PB 2018 defense budget request would see the active-duty component reach 1,314,000, with 815,900 in the reserves, for a total force of 2,219,000. As compared to the projected FY 2018 end strengths in the PB 2017, the Trump administration’s budget would fund an additional 42,800 active-duty servicemembers and an additional 13,600 reservists. However, Congress largely rejected planned force structure reductions during FY 2017. The PB 2018 would increase the active-duty component by 8,100 and the reserves by 2,700 over the funded force structure levels in FY 2017. In particular, President Trump set the goal of a 540,000-strong active-duty Army during the campaign. Under the PB 2017 projections, the size of the Army would have reached a low point of 450,000 in FY 2018, shrinking from a recent high of 566,000 in FY 2010 and FY 2011, following years of declining budgets imposed by the Budget Control Act. A 540,000-strong Army would have been an increase of 80,000 soldiers, or 17 percent, over the planned FY 2017 end strength of 460,000. However, Congress rejected 460,000 as the Army’s active-duty end strength in FY 2017 and funded a higher end strength of 476,000 in FY 2017, for a real end-strength growth of 1,000 soldiers from the FY 2016 end strength of 475,000. Including the active components of the other Services and 79,000 activated Guard and Reserve members, the FY 2018 active-duty military would be 1.393 million people, a slight growth of 15,000 from the post-World War II low of 1.378 million in FY 2016. The PB 2018 asks for an Army of 476,000 soldiers and a Marine Corps of 185,000, the same numbers that Congress funded in FY 2017. It also calls for an additional 4,000 sailors and 4,100 airmen over the FY 2017 appropriations period, for an active-duty force that is 8,100 members larger than in FY 2017. At 1,314,000, the FY 2018 active-duty force would be 32,100 people larger than the PB 2017 requested active-duty end strength and 8,100 more than the end strength funded by Congress in the FY 2017 appropriations bill. The PB 2018 describes this growth in Navy and Air Force active-duty end-strength levels as intended specifically to address readiness challenges, including Air Force pilot and maintainer shortfalls. Maintaining a 185,000-strong Marine Corps will allow it to maintain a 1:2 deploy-to-dwell ratio for major force elements. In the reserve components, the PB 2018 adds an additional 1,000 to the Navy Reserve over the FY 2017 appropriated end-strength levels, 800 to the Air Force Reserve, and 900 to the Air National Guard. This would make a total of 815,900 reservists, for a real growth of 2,700 servicemembers over the FY 2017 end strength funded by Congress. In FY 2017, Congress funded a total reserve end strength of 813,200, 14,700 servicemembers more than the PB 2017 request of 801,200 (see Table 4-1). Like other areas in the defense budget, the Congressional defense committees have seen the Trump administration’s FY 2018 proposal for active-duty and reserve end strengths as unsatisfactorily low. In the House, the House Armed Services Committee (HASC) added an additional 17,000 soldiers to the Army’s total force. HASC added an additional 10,000 active-duty servicemembers to the Army’s active-duty end strength, bringing the Service to 486,000. This Army end strength is 5,000 less than in FY 2015 and would make the Army about the same size it was in FY 2002. The HASC also added 3,000 soldiers to the Army Reserve and 4,000 to the Army National Guard, The Defense Subcommittee of the House Appropriations Committee echoed the HASC by funding an additional 10,000 active-duty servicemembers and 7,000 reservists, but left them unallocated by Service. In the Senate, the Senate Armed Services Committee (SASC) made more modest additions over the PB 2018 end-strength levels, adding 1,000 Marines, 5,000 soldiers to the active-duty Army, and 500 soldiers each to the Army National Guard and Reserves (see Table 4-2). Source: OUSD (Comptroller), CFO, Department of Defense Fiscal Year 2017 Budget Request: Defense Budget Overview, Table A-2, “Active Component End Strength (in Thousands),” and Table A-3, “Reserve Component End Strength (in Thousands)”; OUSD (Comptroller), CFO, Department of Defense Fiscal Year 2018 Budget Request: Defense Budget Overview, Table A-2, “Active Component End Strength (in Thousands),” and Table A-3, “Reserve Component End Strength (in Thousands)”; and House Committee on Appropriations, Department of Defense Appropriations Bill, 2018, Committee Report (Washington, DC: U.S. House of Representatives, June 29, 2017), available at https://appropriations.house.gov/uploadedfiles/hrpt-115-hr.pdf. House and Senate Armed Services Committee numbers are from the respective House and Senate FY18 NDAA summaries: House Armed Services Committee, “Reform and Rebuild: National Defense Authorization Act for FY18,” 2017, p. 6, available at https://armedservices.house.gov/sites/republicans.armedservices.house.gov/files/wysiwyg_uploaded/FY18%20NDAA%20Floor%20Summary%20Draft%20vFinal.pdf; and Senate Armed Services Committee, “NDAA FY18,” June 28, 2017, p. 3, available at https://www.armed-services.senate.gov/imo/media/doc/FY18%20NDAA%20Summary6.pdf. Note: The House Appropriations Committee added 10,000 active-duty servicemembers and 7,000 reservists, but funded this 17,000-member growth in end strength out of the proposed National Defense Restoration Fund, rather than allocating those costs across the Services’ MILPERS accounts. The 1,378,000 active-duty soldiers and activated reservists in FY 2016 comprised the smallest U.S. active-duty force since before World War II. The FY 2016 end-strength was 67,000 servicemembers fewer than that previous post-World War II low, the sharp trough in personnel numbers as U.S. forces demobilized after World War II and before the Korean War. (see Figure 4-3 and Figure 4-4). The active-duty force was at its recent peak of 1,506,000 in FY 2011 before drawing down to 1,378,000 in FY 2016. The reduction of active-duty forces came largely out of the Army and the Marine Corps, which reached their recent maximum end strengths of 566,000 and 203,000 in FY 2011 and FY 2009, respectively. In FY 2016, the end strength of the Army was 16 percent less and the Marine Corps 9 percent less than those maximums. These reductions were driven by the drawdowns of U.S. forces in the wars in Iraq and Afghanistan and the simultaneous imposition of the caps on defense spending by the Budget Control Act of 2011. As manpower-heavy Services, military personnel spending drives a larger share of the budgets of the Army and Marine Corps. By contrast, the Navy and Air Force have steadily shrunk since the early part of the 2000s. The FY 2016 Navy is 15 percent smaller than when it reached its recent end-strength maximum of 383,000 sailors in FY 2002. Similarly, the FY 2016 Air Force is 16 percent smaller than when it reached its recent peak of 377,000 airmen in FY 2004 (see Figure 4-5). Source: OUSD (Comptroller), National Defense Budget Estimates for FY 2018, FY 2018 Greenbook (Washington, DC: DoD, June 2017), Table 7-6, “U.S. Labor Force,” available at http://comptroller.defense.gov/Portals/45/Documents/defbudget/fy2018/FY18_Green_Book.pdf. Overall, the cost of military personnel pays and benefits (MILPERS), at $146 billion, accounts for 23 percent of DoD’s discretionary budget request for FY 2018. 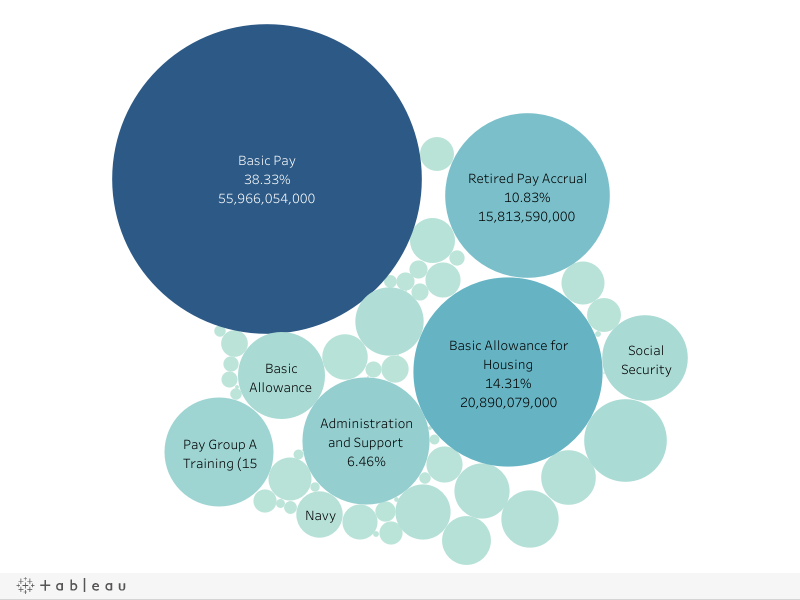 However, military personnel costs are not evenly distributed across the Services. MILPERS costs account for 20 percent of the Air Force’s budget and 27 percent of the Navy’s. 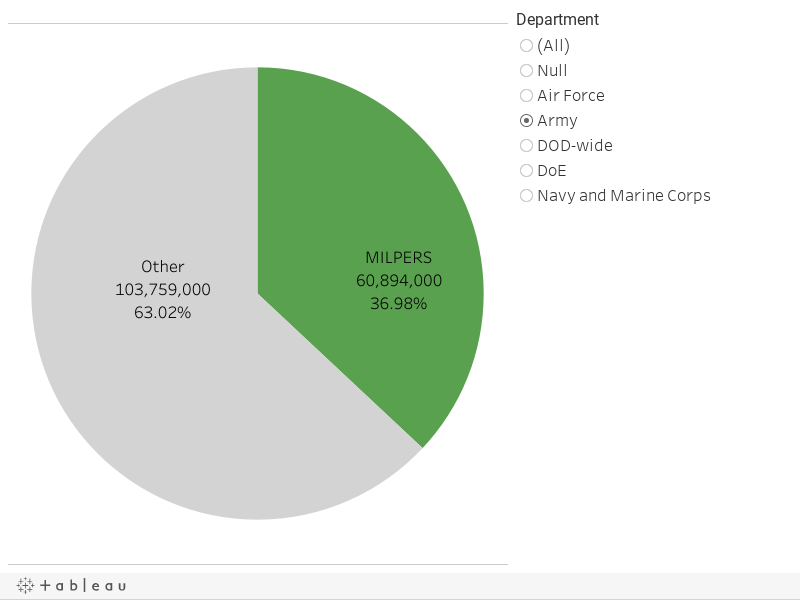 However, as the largest Service with the least procurement funding, MILPERS accounts for 37 percent of the Army’s overall budget (see Figure 4-6). Because the Army is the Service with the largest fraction of its budget devoted to military personnel costs, the Army is most sensitive to changes in the costs of military personnel, such as increases to the amount of basic pay or retention bonuses. Conversely, the Army is less able to fund manpower costs with savings in other appropriations titles, leaving adjustments to end-strength levels as the major lever the Army has to meet topline budget restrictions. Overall, the Army accounts for 42 percent of all of DoD’s MILPERS spending. At $60.9 billion in the FY 2018 budget request, the Army’s MILPERS request is 25 percent greater than the Navy and Marine Corps request for $48 billion (33 percent of total MILPERS spending) and 65 percent greater than the Air Force’s request for $37 billion (25 percent of total MILPERS spending) (see Figure 4-7). Source: OMB, Budget Analysis Branch, Public Budget Database: Budget of the United States Government, Fiscal Year 2018, Budget Authority (Washington, DC: OMB, May 2017), available at https://www.gpo.gov/fdsys/pkg/BUDGET-2017-DB/xls/BUDGET-2017-DB-1.xls. Analysis in Tableau. Source: OMB, Public Budget Database FY 2018. Analysis in Tableau. As compared to the FY 2017 appropriations, the FY 2018 budget request asks for more funding for military personnel costs for each of the Services (see Figure 4-8). These increases would pay for an additional 4,000 sailors and 4,100 airmen in the active component, 1,000 additional sailors in the Navy Reserve, 800 more airmen in the Air Force Reserves, and 900 more airmen in the Air National Guard over the end strength funded by the FY 2017 appropriations bill. The additional funds would also cover a 2.1 percent basic pay increase, higher basic allowance for housing costs, more administration costs, and other rising expenses. Source: VisualDOD data, analysis in Tableau. Overall, at $34.5 billion in the FY 2018 request, the pays and allowances for the Pentagon’s 228,586 officers accounts for 23.6 percent of the MILPERS appropriation request. At $82.9 billion, pays and allowances for the Pentagon’s 1,053,507 enlisted servicemembers accounts for 56.8 percent of MILPERS appropriations requested. Training and pays for reservists, at $21.4 billion, account for 14.7 percent of MILPERS (see Figure 4-9). 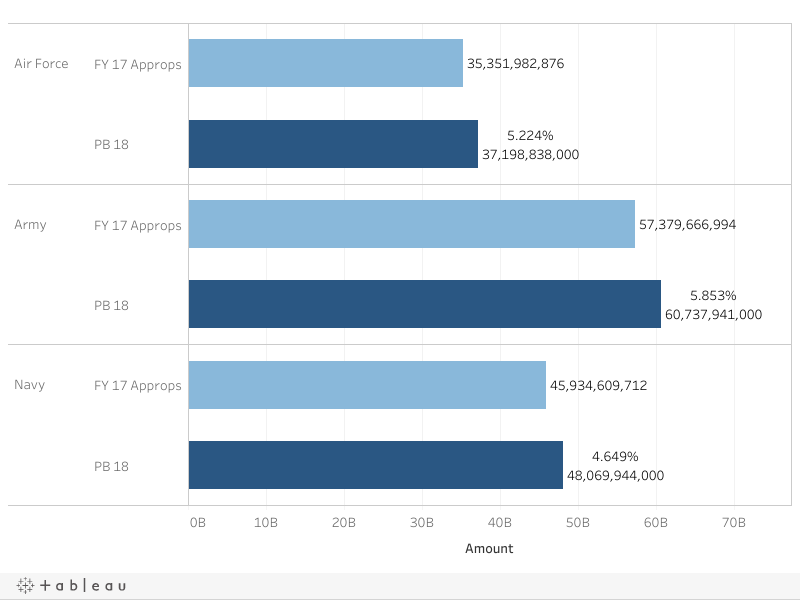 Source: DoD budget data from VisualDOD, analysis in Tableau. Within MILPERS, basic pay; the basic allowance for housing (which covers housing expenses); accrual payments for current servicemembers’ retirement benefits; administrative costs; pay and training costs for reservists; and the basic allowance for subsistence (which subsidizes food costs) make up 79 percent of MILPERS costs, with the balance accounted for by DoD’s payment of the servicemembers’ share of Social Security taxes, training pay, specific allowances, travel and moving expenses, and various types of incentive pays. At $56 billion in PB 2018, basic pay for officers and enlisted servicemembers was the largest single element in the MILPERS title at 38 percent, followed by the basic allowance for housing at $20.9 billion or 14 percent, then accrual payments for current servicemembers’ retirement benefits at $15.8 billion or 10.8 percent (see Figure 4-10). Although predominantly paid for with operation and maintenance (O&M) funds, the Defense Health Program is one of the most important, and expensive, portions of the overall military compensation package. Accordingly, changes to basic pay, the basic allowance for housing, the Defense Health Program, and retirement benefits are the four major levers the Pentagon has to affect the overall compensation cost per servicemember (see Figure 4-11). Source: DoD budget data from VisualDOD. Analysis in Tableau. Source: OUSD (Comptroller), CFO, Department of Defense Fiscal Year 2018 Budget Request: Defense Budget Overview, Table 5-1, “Pay and Benefits Funding”; and DoD budget data from VisualDOD. The average cost per servicemember to DoD as a whole and for each of the military departments has decreased since the recent highs in the FY 2010–FY 2011 timeframe. In the PB 2018, DoD’s average MILPERS costs per servicemember would be $107,106, with additional costs in other parts of the defense budget to finance the Defense Health Program and other benefits as discussed above. This is about a 10 percent decline in MILPERS funding per servicemember from FY 2010. This pattern of declining MILPERS costs per servicemember is repeated within the military departments (see Figure 4-12). While still the highest of the military departments, the Army’s MILPERS cost per active-duty servicemember has declined the most, by 14.5 percent, since the recent high of $142,471 in FY 2010. Across DoD as a whole, the total pays and allowances for officers and enlisted personnel has remained relatively constant since FY 2012. Total MILPERS pays and allowances for officers averaged $148,758 per officer annually, while total MILPERS pays and allowances for enlisted personnel averaged $75,631 per enlisted servicemember annually (see Figure 4-13). These totals can be seen as the MILPERS portion of the present-day compensation cost to DoD per officer or enlisted servicemember. The totals include a range of cash and in-kind compensation as well as current payments for future benefits, such as retirement accrual benefits, but do not include benefits paid for in other areas of the budget, such as the Defense Health Program, the commissary subsidy, or current payments for future TRICARE for life benefits, as discussed above. Source: OUSD (Comptroller), FY 2018 Greenbook, Table 6-8, “DoD Budget Authority by Public Law Title (FY 1948 to FY 2018),” Table 6-19, “Army Budget Authority by Public Law Title (FY 1948 to FY 2018),” Table 6-20, “Navy Budget Authority by Public Law Title (FY 1948 to FY 2018),” Table 6-21, “Air Force Budget Authority by Public Law Title (FY 1948 to FY 2018),” and Table 7-5, “Department of Defense Manpower.” Analysis by CSBA. Source: DoD budget data from VisualDOD. Analysis in Tableau. Pays and allowances include basic pay, the basic allowance for housing, the basic allowance for subsistence, retired pay accrual, allowances, special and incentive pays, Thrift Savings Plan matching contributions, and DoD’s payment of social security tax on behalf of servicemembers. Numbers of officers and enlisted personnel are from Defense Manpower Data Center reports of active-duty military personnel by rank and grade, updated monthly, which are available at https://www.dmdc.osd.mil/appj/dwp/dwp_reports.jsp. As in past years, the PB 2018 proposes changes to military pay and benefits in order to reduce cost growth. The Trump administration has proposed a basic pay increase of 2.1 percent, the same amount that Congress provided for in FY 2017, instead of the 2.4 percent that would match the nation-wide Employment Compensation Index (ECI), as mandated under current law. However, in the FY 2018 National Defense Authorization Act (NDAA), the HASC included a larger pay increase of 2.4 percent. The SASC funded a pay increase of 2.1 percent, in line with the administration’s proposal. Congress has historically raised military pay to at or above the ECI benchmark (see Figure 4-14). For FY 2017, the Obama administration requested a military pay raise of 1.6 percent, and Congress raised military pay by the ECI benchmark of 2.1 percent. Since FY 2001, military pay has overall grown faster than the ECI, while DoD civilian pay has lagged (see Figure 4-15). Source: OUSD (Comptroller), FY 2018 Greenbook, Table 5-12, “Military and Civilian Pay Increases Since 1945 (1945 to 2022).” ECI annual increases are calculated from Bureau of Labor Statistics, Employment Cost Index Historical Listing, Volume III (April 2017), available at https://www.bls.gov/web/eci/echistrynaics.pdf. Source: OUSD (Comptroller), FY 2018 Greenbook, Table 5-12, “Military and Civilian Pay Increases Since 1945 (1945 to 2022),” ECI annual increases are calculated from Bureau of Labor Statistics, Employment Cost Index Historical Listing, Volume III. Congress enacted major changes to the military retirement system in the FY 2016 NDAA. Following the recommendation of the Congressionally-mandated Military Compensation and Retirement Modernization commission, Congress added a 401(k)-like benefit, creating a blended retirement system. The blended retirement system reduces the defined benefit pension for new servicemembers in order to provide all servicemembers some retirement benefits via a Thrift Savings Plan, the government version of a 401(k). New servicemembers who enlist after January 1, 2018 will receive a lower defined-benefit pension upon retirement after at least 20 years of service. Instead of a 2.5 percent multiplier of the average of the highest three years of pay, the retirement benefit multiplier for new servicemembers will be 2 percent. In addition, all servicemembers will receive a 1 percent salary contribution to a Thrift Savings Plan, and DoD will match servicemembers’ contributions up to 5 percent. For example, if a servicemember contributes 3 percent of their pay to the Thrift Savings Plan, DoD will contribute 1 percent of their pay automatically and match the additional 2 percent, for a total DoD contribution of 3 percent. DoD’s contributions vest to servicemembers after 3 years of service. The blended system also includes continuation pay bonuses between the 8th and 12th year of service, and the option to take retirement befits as a lump sum rather than a monthly payment. Current servicemembers who have served less than 12 years as of January 1, 2018, can opt into the new system if they wish. All other current servicemembers are grandfathered into the old plan. This shift to a blended retirement system reduces the all-or-nothing character of the previous retirement system and ensures that all servicemembers will receive at least some retirement benefit, although the defined-benefit element is still the larger element of the expected retirement benefit for those who serve at least 20 years. It is very similar to the “Redux” reduction in retirement benefits enacted in the 1980s, which also reduced the retirement benefit multiplier from 2.5 percent to 2 percent. However, the “Redux” plan was made optional before the first tranche of servicemembers who entered under it retired. For the FY 2018 NDAA, DoD is asking Congress to alter the Thrift Savings Plan contribution statutory language to allow DoD to continue to contribute automatic and matching funds to servicemembers after their 26th year of service. Neither the House nor the SASC version of the FY 2018 NDAA includes a corresponding provision. Congress also enacted major changes to the existing TRICARE health plans in the FY 2017 NDAA. TRICARE plans will be consolidated into Prime—much like an HMO plan, and the new Select, which will replace the current Standard and Extra PPO-style plans. Although Congress has typically been reluctant to increase the proportion of healthcare costs that are borne by current beneficiaries, Congress raised annual enrollment fees for new military retirees who elect to continue their TRICARE coverage and made various adjustments to the cost-sharing and total out-of-pocket caps. In the PB 2018, DoD is proposing to end the grandfathering of the lower TRICARE annual enrollment fees for current military retirees and tier TRICARE co-pays according to whether the care is received at a military treatment facility, in-network, or out-of-network in order to control costs and encourage the use of military treatment facilities. Active-duty family members and their families, medically retired servicemembers and their families, and survivors of servicemembers who died on active-duty would continue to receive care at no out-of-pocket cost. The House version of the FY 2018 NDAA does not contain DoD’s proposed TRICARE change, while the SASC version would end the grandfathering of current military retirees. In the FY 2016 NDAA, Congress raised pharmacy co-pays by $3 and indexed future co-pay increases to changes in retiree pay, but Congress rejected tying future co-pay increases to drug costs in the FY 2017 NDAA. In the PB 2018, DoD is requesting higher pharmacy co-pays and shifting the co-pays to further encourage generic and mail-order prescriptions. While the House version of the FY 2018 NDAA does not include any pharmacy co-pay changes, the SASC version includes pharmacy co-pay increases slightly above the administration’s proposal. In addition to the total force of 1,314,000 active-duty servicemembers and 815,000 reserve-component servicemembers, the PB 2018 defense budget requests funding for 771,000 DoD civilians, of which 740,000 are DoD direct hires. DoD civilian direct hires would make up 27 percent of the overall federal civilian employee workforce in FY 2018. 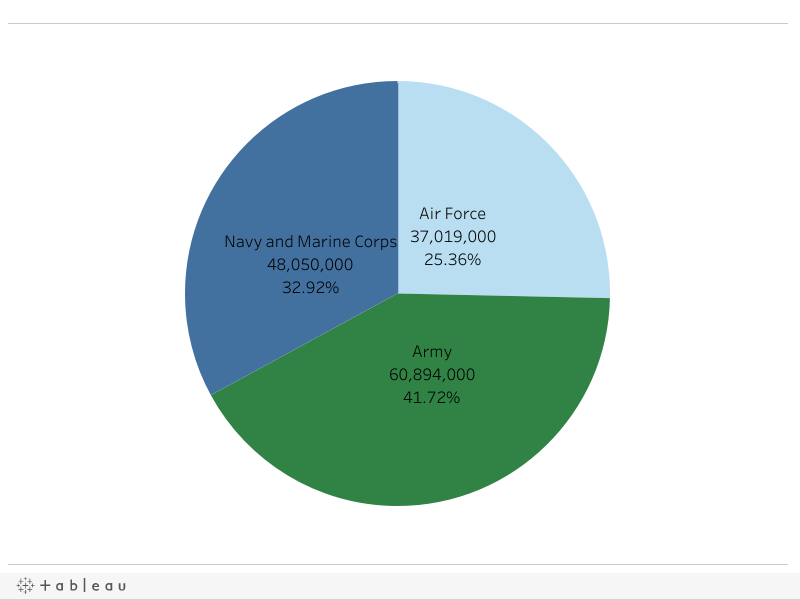 In general, the number of DoD civilians directly employed by DoD has tended to move in concert with the size of the active-duty force (see Figure 4-16). The overall ratio of active-duty to civilian DoD employees has fluctuated between 2.14 to 1.88 active-duty military personnel to civilian employees over the past 30 years. However, the ratio has fallen steadily since 2004 as DoD has either more rapidly added civilians than active-duty forces or more rapidly shrunk the size of the active-duty workforce compared to the civilian workforce (see Figure 4-17). The ratio of active-duty personnel to civilian DoD direct employees also varies across the military departments. Overall, since 2000, the Air Force has had the lowest ratio of active-duty to civilian personnel, with about two active-duty personnel for each civilian employee, followed by the Army, with 2.2. The Navy has maintained an average ratio of 2.7 active-duty personnel for each civilian employee since 2000, driven in part by the flat force structure pyramid of the Marine Corps. The Navy, Air Force, Army, and the collective set of defense agencies each have approximately 200,000 civilians as of FY 2017. The number of civilian DoD employees within each military department and the total of the civilians affiliated with the defense agencies converged sharply between FY 2013 and FY 2014, when the Army lost 49,000 civilians, the Navy lost 15,000, and the Air Force lost 13,000, while the defense agencies collectively added 60,000. This apparent reshuffling may have been driven by the government shutdown at the start of FY 2013 and the FY 2013 sequester, which resulted in eleven unpaid furlough days for DoD civilians (see Figure 4-22). Achieving the right size and distribution of the Pentagon’s activities across the active-duty, activated reserve, civilian and contractor workforce, and contracted services has been a perennial challenge for DoD. In general, the two major arguments have centered around, first, what proportion of supporting activities should be performed by uniformed servicemembers rather than civilian employees or contracted out—with a goal of raising the proportion of the uniformed workforce performing combat duties instead of support functions—and, second, whether DoD can save money or improve efficiency by shifting the tasks performed to a different element of the overall Pentagon workforce or simplifying and eliminating some tasks. A 2015 CBO analysis found wide divergences between the Services in whether military servicemembers, civilian employees, or contractors filled positions that the Pentagon had classified as “commercial.” For example, the Army had uniformed personnel occupying just 10 percent of positions related to computing and information services, while the Navy, Air Force, and Marine Corps had uniformed personnel occupying 32 percent, 37 percent, and 42 percent of these roles, respectively. 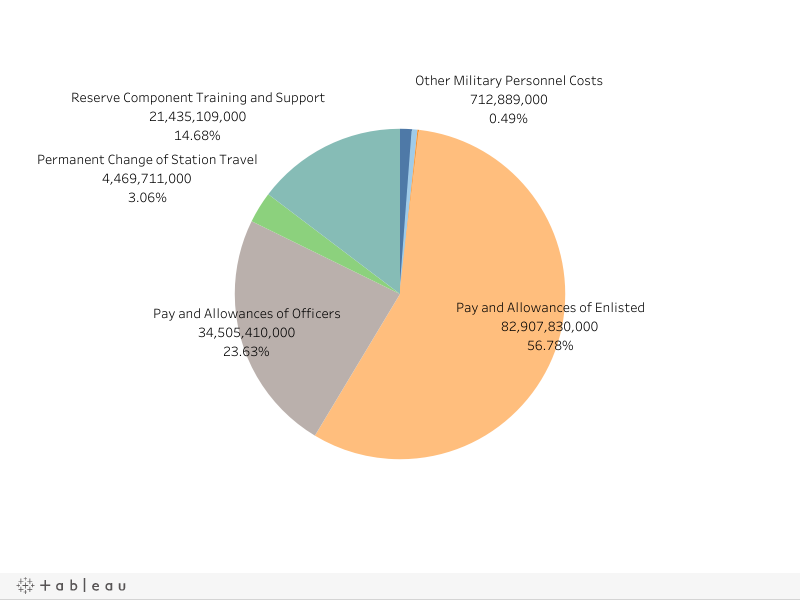 The same CBO report analyzed the relative cost of the average individual military and civilian employee in specific support occupations and found that the uniformed servicemember had a total cost to the federal government of $135,200 annually, while the civilian was $39,200 cheaper at a total annualized cost of $96,000. However, this cost disparity was largely due to the annualized cost of the military servicemember’s VA and medical disability benefits. For DoD, the civilian’s annualized cost was slightly more than the annualized cost of the uniformed servicemember in that occupation, at $106,100 compared to $103,400. Congress has periodically legislated on DoD’s workforce mix via the NDAA. In the FY 2013 NDAA, Congress required the Pentagon to create an efficiencies plan to ensure that the civilian employee and contractor workforces were “appropriately sized to support and execute the National Military Strategy, taking into account military personnel and force structure levels.” This efficiency plan was also required to save money equal to that saved by reductions to military personnel base pay due to end-strength reductions. However, this workforce plan and savings requirement was repealed four years later by the FY 2017 NDAA, which instead mandated an annual report on the management of the civilian workforce and limited the performance of civilian functions by military personnel. The House amendment to the Senate version of the FY 2017 NDAA attempted to mandate a report that on the structure and number of both civilians and contractors within DoD. However, this provision was not included in the final bill text to the conference committee. The House Armed Services Committee’s version of the FY 2018 NDAA includes a provision adding the civilian workforce to a FY 2017 NDAA-mandated report on the Pentagon’s organizational and management goals, to include eliminating or consolidating unnecessary or redundant functions in DoD, efforts to delayer or reorganize headquarters functions, and force management and shaping goals. The Senate Armed Services Committee’s version would mandate a report on the numbers of detailed and contracted personnel in the Office of the Secretary of Defense and the Service secretary offices and include them in the limitations on the total number of personnel employed in those offices. Katherine Blakeley is a Research Fellow at the Center for Strategic and Budgetary Assessments. Prior to joining CSBA, Ms. Blakeley worked as a defense policy analyst at the Congressional Research Service and the Center for American Progress. She is completing her Ph.D. in Political Science from the University of California, Santa Cruz, where she received her M.A. Her academic research examines Congressional defense policymaking. The Center for Strategic and Budgetary Assessments is an independent, nonpartisan policy research institute established to promote innovative thinking and debate about national security strategy and investment options. CSBA’s analysis focuses on key questions related to existing and emerging threats to U.S. national security, and its goal is to enable policymakers to make informed decisions on matters of strategy, security policy, and resource allocation. Office of the Undersecretary of Defense (OUSD) (Comptroller), National Defense Budget Estimates for FY 2018, FY 2018 Greenbook (Washington, DC: DoD, June 2017), Table 7-5, “Department of Defense Manpower,” p. 246. Moshe Schwartz, John F. Sargent Jr., Gabriel M. Nelson, and Ceir Coral, Defense Acquisitions: How and Where DoD Spends and Reports Its Contracting Dollars (Washington, DC: Congressional Research Service, December 20, 2016), pp. 5–6. Office of Management and Budget (OMB), Budget Analysis Branch, Public Budget Database: Budget of the United States Government, Fiscal Year 2018, Budget Authority (Washington, DC: OMB, May 2017), available at https://www.gpo.gov/fdsys/pkg/BUDGET-2017-DB/xls/BUDGET-2017-DB-1.xls. Analysis in Tableau. OUSD (Comptroller), Chief Financial Officer (CFO), “Fiscal Year 2018 Budget Request,” PowerPoint briefing, May 2017, slide 9, available at http://comptroller.defense.gov/Portals/45/Documents/defbudget/fy2018/fy2018_Budget_Request.pdf. OUSD (Comptroller), National Defense Budget Estimates for FY 2018, Table 7-5, “Department of Defense Manpower,” p. 246. Historical Army end-strength numbers are from OUSD (Comptroller), National Defense Budget Estimates for FY 2018, Table 7-5, “Department of Defense Manpower,” p. 246. Numbers of officers and enlisted servicemembers as of May 31, 2017. Defense Manpower Data Center (DMDC), “Active Duty Military Personnel by Rank/Grade,” DoD Personnel, Workforce Reports & Publications, May 31, 2017, available at https://www.dmdc.osd.mil/appj/dwp/dwp_reports.jsp. Benjamin Bryant et al., Report of the Military Compensation and Retirement Modernization Commission, Final Report (Washington, DC: Military Compensation and Retirement Modernization Commission, January 2015), available at http://www.mcrmc-research.us/02%20-%20Final%20Report/. Kristy N. Kamarck, Military Retirement: Background and Recent Developments (Washington, DC: Congressional Research Service, February 27, 2017), available at https://fas.org/sgp/crs/misc/RL34751.pdf. National Defense Authorization Act (NDAA) for Fiscal Year 2018, H.R. 2810, 115th Cong. (as Reported in House, July 6, 2017); and NDAA for Fiscal Year 2018, S. 1519, 115th Cong. (as Placed on Senate Calendar, July 10, 2017). For a detailed rundown of military personnel issues addressed in the FY 2017 NDAA, see Kristy N. Kamarck, Don J. Jansen, Lawrence Kapp, R. Chuck Mason, and Barbara Salazar Torreon, FY 2017 National Defense Authorization Act: Selected Military Personnel Issues (Washington, DC: Congressional Research Service, January 23, 2017,) available at https://fas.org/sgp/crs/natsec/R44577.pdf. OUSD (Comptroller), CFO, Department of Defense Fiscal Year 2018 Budget Request: Defense Budget Overview (Washington, DC: DoD, May 2017), pp. 5-8–5-10, available at http://comptroller.defense.gov/Portals/45/Documents/defbudget/fy2018/fy2018_Budget_Request_Overview_Book.pdf. NDAA for Fiscal Year 2018, H.R. 2810 (July 6, 2017); NDAA for Fiscal Year 2018, S. 1519 (July 10, 2017), Section 707. OUSD (Comptroller), CFO, Department of Defense Fiscal Year 2018 Budget Request, p. 5-11. NDAA for Fiscal Year 2018, H.R. 2810 (July 6, 2017); NDAA for Fiscal Year 2018, S. 1519 (July 10, 2017), Section 706. Schwartz, Sargent, Nelson, and Coral, Defense Acquisitions: How and Where DoD Spends and Reports Its Contracting Dollars, pp. 5–6.